» Does anyone know a simple radio? 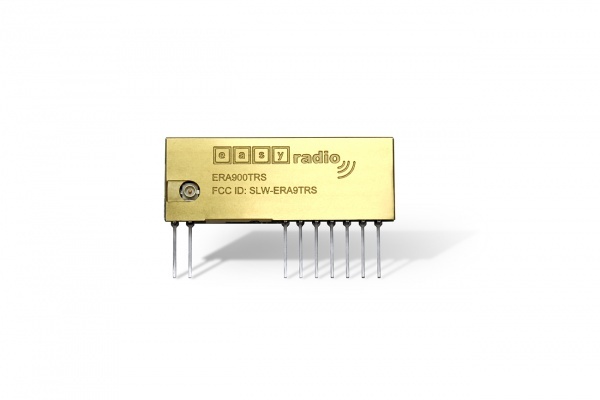 I have been using a radio transceiver from RFDigital that has become obsolete. I use UART to talk to it from a microcontroller and PuTTY from my laptop USB to serial converter. It has a range of about 100m line of sight. 9600 baud. Does anyone know of something similar that is easy to use? Like hook up two wires from UART and good to go. Zigbee looks complicated with some kind of a stack. I want easy to learn. I am too old and stupid for anything complicated. Most of their modules are SPI interface, are you looking only for transceiver mod, or combined with arduino module? I have been using a radio transceiver from RFDigital that has become obsolete. Am assuming that's RF Digital RFDP8 series or RFduino series. I use UART to talk to it from a microcontroller and PuTTY from my laptop USB to serial converter. It has a range of about 100m line of sight. 9600 baud. RF Digital was acquired; its SimbleeTM is still alive though uncertain how to implement transparent UART with it. It has a form of Bluetooth mesh networking to get range though it'll be competing against Bluetooth 5 mesh networking which has some recent module releases. Does anyone know of something similar that is easy to use? Microchip Bluetooth 4 modules also have transparent UART, Android and iOS apps with terminal feature; IIRC, Android creates a tty device for a Bluetooth 4 UART service so can create for Android. OK. thanks guys. I will look into these. I am definitely NOT an Arduino guy. Strictly AS7 and Atmel ICE. Any other non-arduino choices anyone? RFDP8. It is a pretty good radio. At least it used to be. The off-the-shelf Nordic Semiconductor builds have a transparent UART that's an order of magnitude faster than 9600bps. Would take some effort to try it; am assuming there's snippets of Android and iOS source code for the operator's end. Some of those Rigado Bluetooth look interesting. They all look interesting. Now I have my research set out for me to choose one. Thanks Jim. Those look interesting too. Wow, lot of good stuff to check out. I like the Rigado Bluetooth price of $10. Some of those have ATMega328's on them. Pretty interesting. I can program them with AS7 and ICE. But I am mostly looking for just the transceiver mod. I am using an ATmega328 and the RFDP8 radio now to control an LED lamp from my laptop. Need to get the perfect white for museum lighting out of my lamp.